The thing about traveling is that you always end up back where you started. Ashes to ashes and all that big-picture stuff. 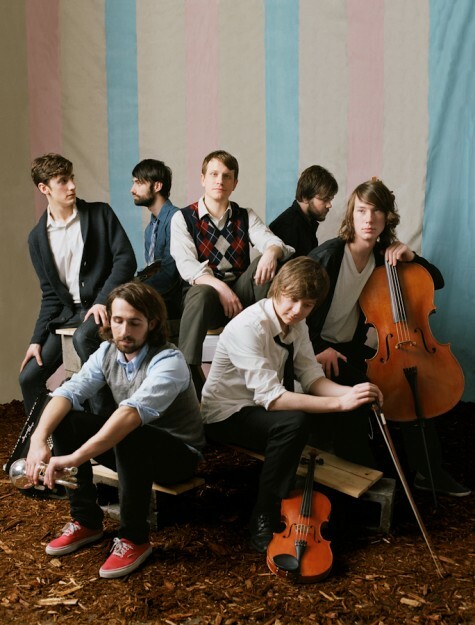 For Hey Marseilles (heymarseilles.com), travel is as much a state of mind as location of body. This is a seven-piece Northwest band deeply rooted to its place of origin but equally anxious to get away, to see it all. Not escapism, but expansion: Listen closely to To Travels & Trunks and you’ll hear faraway places named not so much as a wish list but as incantation. The broader your horizon, the deeper your longing, the more genuine your experience. And so, in 2008, three guys embark on a musical adventure instigated by one’s first melody on his brand-new used accordion. And, some months later, seven guys—the original trio plus a few old friends—get together in a garage in Seattle and record an album. To Travels & Trunks is both Hey Marseilles’ mission statement and its hazy dream put to music. The Hey Marseilles sound is immediate, evocative, mostly acoustic, always emotive. It’s classically-trained brothers Sam and Jacob Anderson on cello and viola, their strings grand and mournful on To Travels & Trunks‘ sweeping title track. It’s the wheeze and moan of Philip Kobernik’s accordion, simultaneously the gawkiest and most romantic of all instruments, opening the gorgeous “From a Terrace,” and his kid-at-a-carnival Rhodes on the 6/8 spin of “Gasworks.” It’s Nick Ward’s electric guitar on the epic “Calabasas,” stretching into the distance like an open road. It’s the Dixieland swagger of Patrick Brannon’s trumpet on uptempo lead single “Rio”—recently Song of the Day at NPR, Spinner.com, and KEXP. It’s a songwriter’s urgent expression via vocalist Matt Bishop, expanded with huge singalong choruses, unraveled by a virtuoso band’s sinuous arrangements. It’s modern vintage, a folk-pop jam session at a vanished cabaret on the Seine, an indie rocker’s fantasy of his grandparents’ first kiss. By developing this sound—a process captured on To Travels & Trunks—Hey Marseilles discovered that the band isn’t any one of these things but all of them. And none of them, too: When Hey Marseilles headlined a holiday party at Neumo’s in Seattle, nobody expected MC Thomas Grey of local party-hop outfit Champagne Champagne to spit a few bars over a Christmas-song medley, but there he was, and somehow it made sense. Just like the inclusion of their cover of Daniel Johnston’s “True Love Will Find You in the End” in the Starbucks-compiled Sweetheart 2010. Moments like that—and more, during Hey Marseilles’ headlining slots at local clubs and winning appearances at major Northwest festivals like Bumbershoot, Capitol Hill Block Party, Doe Bay Fest—keep fans guessing while rendering them true believers. Because really, this is just a bunch of guys making the music they wanna hear. Because really, with a palette this colorful, anything—and anywhere—is possible. Next NEW WU-TANG CLAN AND OTHER CD RECOMMENDATIONS FROM THE RX! Previous BUY STUFF, GET FREE STUFF: RELEASE THE SUNBIRD (ROGUE WAVE) 7-INCH, EVIL-LOOKING ALL SHALL PERISH TEE!